I've just posted two recordings of a juvenile Bewick's Wren "babbling" as it tries to reproduce the songs it hears. In the first, the babbling is mostly just a random set of whistles, squacks, and trills. In the second recording, captured just a week later, the juvenile's singing is much more accomplished. Here's a backyard chickadee singing a different song. I'll soon be putting up some mp3 files of at least 3 Black-Capped Chickadee songs. I've been videotaping chickadees in my back yard, trying to capture them singing. I've just posted the first video on the Black-Capped Chickadee page and on YouTube. More will be forthcoming. Enjoy! I chased a Bewick's Wren around the backyard with my videocamera yesterday and managed to get two photos that I've just posted on the Bewick's Wren page. They're not perfect - wrens don't sit still long enough to make good subjects - but I hope you'll enjoy them until I can get some better ones. How to sing like a Bewick's Wren? Practice! A juvenile Bewick's Wren was "babbling" in the backyard today, singing a few notes of one song, then a few notes of another, interspersing them with random wrenish buzzes and trills. He's learning the songs of the local adults and that's quite a job, since an adult typically sings more than 15 songs. These songs vary by geographical region, with different "dialects" recognized in the Eastern, Western, and Southern US. I've recorded nearly a dozen of the local songs and you can hear them on my Bewick's Wren page. I'm so enamored with these songs that I use one as the ringtone for my cell phone. Smithsonian Magazine has a great article about the book "A Singing Life of Birds", which describes this "babbling" behavior of juvenile Bewick's Wrens. 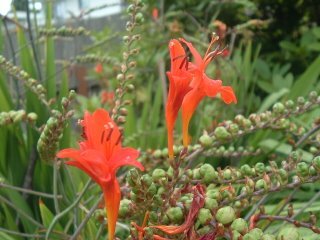 The Crocosmia in our backyard have almost finished flowering, but the Anna's Hummingbirds are still visiting it for its nectar. The male hummingbirds will defend this territory, buzzing and spitting in battle above the backyard like an enraged hive of bees. The victorious male will then often perform his courtship display, hovering a few feet above the flowers, then rising straight up, as if in an elevator, to at least 80 feet. He then dives straight down, pulling up in a curve at the last instant. He rises to about 20 feet off the ground, then hovers and gives out his victory cry. 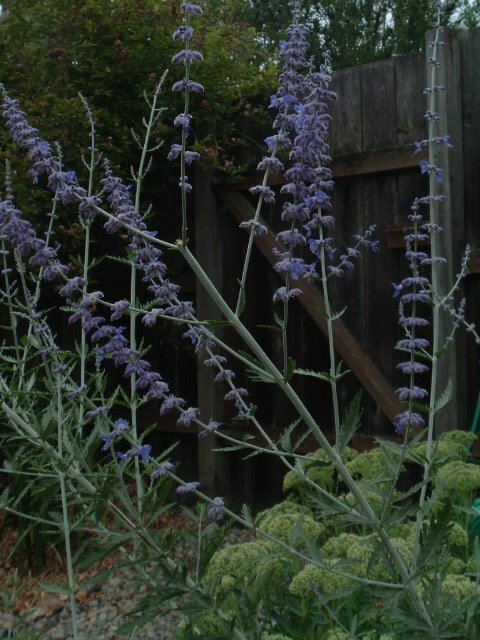 As I write this, a female Anna's has just visited the Crocosmia, then visited several Russian Sage (Pelkovia) outside my office window. She didn't seem too impressed with the taste of the sage. Perhaps it's time for me to put out the hummingbird feeder. The Seattle BirdCam has been reborn as a blog. I'll be able to add fresh material - bird images, videos, and sound - more easily in this format. Enjoy, and let me know of any improvements you think of!